When Soheil Nasseri played his New York debut recital just over two years ago, his varied program showed him as both an inventive, technically precise interpreter of standard fare and a virtuosic performer of contemporary works. 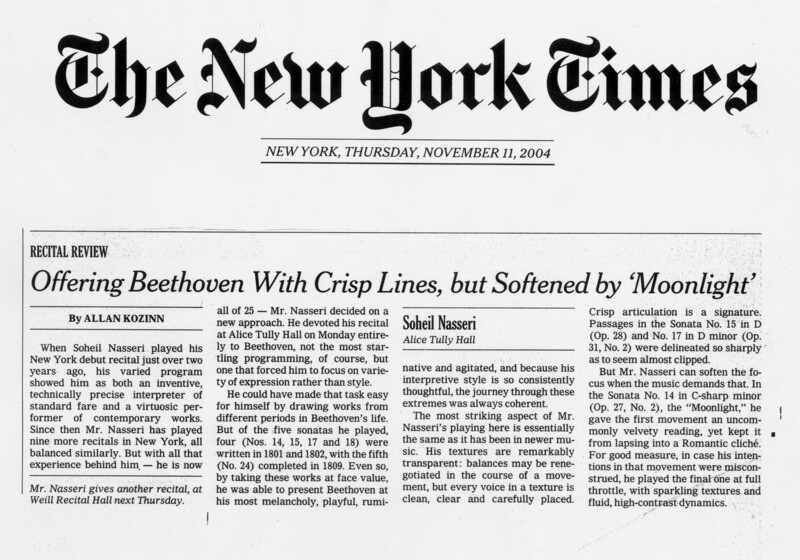 Since then Mr. Nasseri has played nine more recitals in New York, all balanced similarly. But with all that experience behind him – he is now all of 25 – Mr. Nasseri decided on a new approach. He devoted his recital at Alice Tully Hall on Monday entirely to Beethoven, not the most startling programming, of course, but one that forced him to focus on variety of expression rather than style. He could have made that task easy for himself by drawing works from different periods in Beethoven’s life. But of the five sonatas he played, four (Nos. 14, 15, 17 and 18) were written in 1801 and 1802, with the fifth (No. 24) completed in 1809. Even so, by taking these works at face value, he was able to present Beethoven at his most melancholy, playful, ruminative and agitated, and because his interpretive style is so consistently thoughtful, the journey through these extremes was always coherent. The most striking aspect of Mr. Nasseri’s playing here is essentially the same as it has been in newer music. His textures are remarkably transparent: balances may be renegotiated in the course of a movement, but every voice in a texture is clean, clear and carefully placed. Crisp articulation is a signature. Passages in the Sonata No. 15 in D (Op. 28) and No. 17 in D minor (Op. 31, No. 2) were delineated so sharply as to seem almost clipped. But Mr. Nasseri can soften the focus when the music demands that. In the Sonata No. 14 in C-sharp minor (Op. 27, No. 2), the “Moonlight,” he gave the first movement an uncommonly velvety reading, yet kept it from lapsing into a Romantic cliché. For good measure, in case his intentions in that movement were misconstrued, he played the final one at full throttle, with sparkling textures and fluid, high-contrast dynamics. Mr. Nasseri gives another recital, at Weill Recital Hall next Thursday.